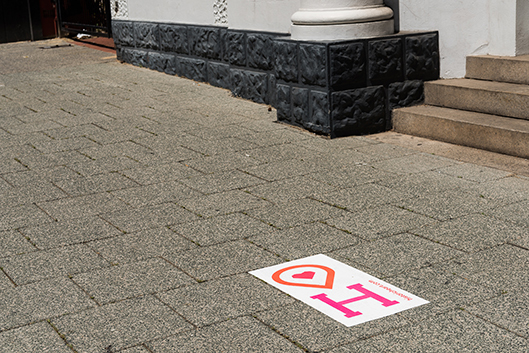 Historic Heart of Perth Inc's first project sees 65 planter boxes and benches installed across Perth's east end, from Barrack Street to Irwin Street. 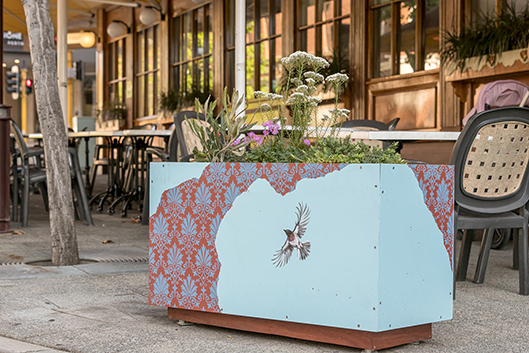 This is a patina of what's West Australian, with the planter boxes painted by West Australian artists and planted with West Australian native plants. This first project by Historic Heart of Perth Inc signifies new energy and change in the east end. 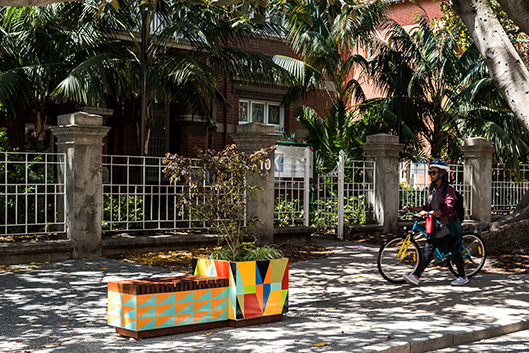 The painted surfaces of the planter boxes and benches act as street level visual activation. Clustering the planter boxes into groups for particular artists will ensure a rhythmic pattern of visuals that will meaningfully create sight-lines or art pathways within the Historic Heart neighbourhood. There were two artist prizes for this project. These were announced at a celebration on Monday 27th November 2017. The winner of the People's Choice Award (selected via online voting) was James Giddy and the winner of the Judge's Choice Award (selected by Nathan Giles from the Perth Public Art Foundation) was Clare McFarlane. Jo Darbyshire, a visual artist based in Fremantle, uses colour and motifs to celebrate and reflect a sense of place. Caspar Fairhall’s work can be seen as asking questions of the viewer such as: What does it mean to represent space in an image? How does the image’s space relate to the space and time outside the image? What does it mean to both look into and at an image? "Art being the tool for the ongoing learning Journey"
Born in Gnowangerup in 1971, Peter Farmer lived a semi-traditional early life on the reserve until his family moved into a house in the late 1970s. Since graduating from Curtin University in 2001 he has established a significant art practice and he works extensively in the education sector to help the wider community understand the deep connectedness his people have to the environment and all of the flora and fauna that reside in it. "I believe that art can bring communities together to learn and communicate stories, like we did in traditional times"
Peter Farmer Jnr is the first Minang Man in his family to not be born in Minang country (Albany or Gnowangerup). His mother being Ballardong and his father Minang, he claims connections through his paternal Grandmother’s country “Wadjuk”, through his birthplace (Subiaco). Under the mentorship of his father and through tertiary study, Peter is fast developing his visual arts alongside a commitment to football and a modelling portfolio. James Giddy was born in South Africa and from childhood has lived in Perth. Since graduating in Fine Arts in 2016 he has painted numerous murals, locally and overseas. His work is often inspired by environmental conservation drawing inspiration from people, landscape and the natural world that he encounters. Allowing space around his subjects emphasizes his subject and draws attention to their beauty and vulnerability. Ron Nyisztor is a Western Australian artist working with a wide range of materials and subjects; he has been exhibiting regularly since 1989. His consistent practice involves discarded building materials being used as part of the actual work and also as support grounds for paintings. As still life subjects for paintings the found objects are incorporated into dynamic compositions. The mundane subject matter used in his work attains compelling intrigue; it communicates a sense of the metaphysical expressed through familiar and extra -ordinary means. Jurek Wybraniec’s work is often informed by his interest in the aesthetics of popular culture and the everyday. Through a reductive method his paintings present a language that combine colour, materials and space in abstract ways. Alex Spremberg was born in Germany in 1950 and has resided in Perth since 1982. He has widely exhibited his work nationally and internationally, and maintained a long-standing commitment to teaching art in the tertiary sector. He is the recipient of many awards, being well regarded for his painting practice, and in 2017 he was awarded his Doctorate. Clare McFarlane completed studies in Cultural Heritage alongside her Masters and honours in Fine Art. Her work often references the histories of scientific inquiry and the decorative arts to investigate Australian identity. Drawing on the designs of the William Morris Company (founded in the UK during the 1860s), she combines this lyrical Pre-Raphaelite patterning with the detailed depiction of birds, butterflies, insects and plants native to Australia, arranged so as to reference the collection of specimens for scientific inquiry. Bruno Booth is an artist based in Fremantle who paints within a minimal aesthetic and who enjoys a love of the unexpected. RUAH Community Services offers support across areas of homelessness, mental health and wellness, and domestic violence and justice. Their aim is to operate with “Open Hearts and Bold Strides”. Ruah have established an Art Group who meets regularly to work together. Green World Revolution has been engaged to take care of Historic Heart's plants and planter boxes. GWR is a not for profit social enterprise, growing jobs for the unemployed, providing pathways to sustainable livelihoods for people who are suffering from long-term unemployment. Historic Heart has created two jobs through this project for Edward and Jess - pictured here with artist Clare McFarlane. 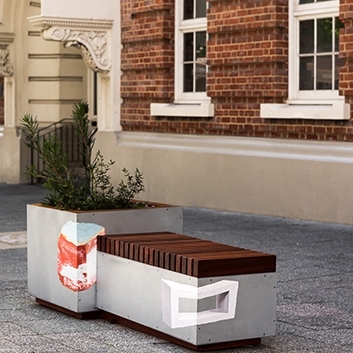 Historic Heart's bespoke planter boxes and benches were designed by Eekos Architects and fabricated by .reSPOKE. 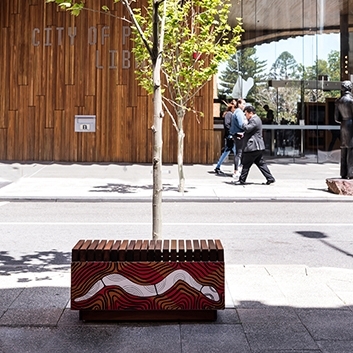 East Perth based .reSPOKE designs and fabricates unique street furniture for public spaces - aiming to foster community spirit. Each project is carefully crafted to complement the site and the surrounding businesses, enticing people to linger a little longer. Selected artists were invited to paint the planters prior to installation on the streets of Perth’s east end. These artists were selected by experienced art curator Margaret Moore. All artists involved are West Australian. that exists to develop more opportunities for WA’s artists. 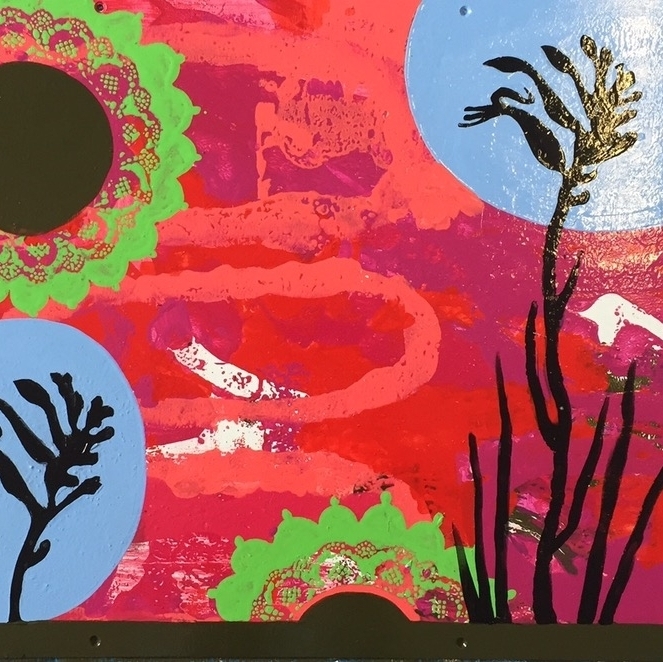 5 of the artists involved are from the Ruah Art Group - Ruah offers support across areas of homelessness, mental health and wellness, and domestic violence and justice. Their Art Group meets regularly to work together. Margaret Moore pictured here with artists Peter Farmer and Peter Farmer Jnr. Gardening expert Sabrina Hahn was engaged to select the plants for our planter boxes. Species were selected to showcase some of the most interesting and unique West Australian flora that grows from Esperance to the Murchison, including one species that is on the Priority 4 list of endangered. Plants have been deliberately not overcrowded so that they will develop strong root systems and not compete with each other. Banksia littoralis (Swamp Banksia) - A tree growing up 8m with showy yellow/orange flowers from March to August. This tree is a food source for Black Cockatoos, honeyeaters, native bees and is an important habitat tree for burrowing frogs. Banksia blechnifolia (Ground Cover Banksia) - An unusual ground cover Banksia that originates in a very small area from Esperance to Ravensthorpe. It has cream/orange developing into red/brown cones from September through to November. Brachyscome Lilac Sunrise (Swan River Daisy) - This is a hybrid of the small daisy plant that grows in WA, SA, VIC and NSW. The original species Brachyscome iberidifolia is found throughout WA. It attracts both native and European bees. Kennedia beckxiana (Cape Arid Pea) - This climber/ground cover is found in a very small area in Cape Arid National Park and is listed as being Priority 4 on the conservation list. It has bright red pea-shaped flowers with a green centre in spring and summer. Leptospermum sericeum (Esperance Tea Tree) - A silver leafed shrub growing to 1m in height with soft pale pink flowers in May through to October. It originates from the Esperance sandplains and Jarrah forests around Perth. The seeds are an important food source for seed eating birds and native pollinators. Scaevola aemula (Fanfare flower) - An attractive ground cover found all around the lakes areas in Perth and Esperance with blue flowers from August to December, it is a very flower cover for 2 species of native bees who depend on its pollen.